According to data from the last 15 months, office buildings and shopping centers are the main investments in the market. However, over the direct purchase, investors, both Spanish and foreign, have chosen to participate in the market through new listed real estate investment trusts (SOCIMIs). Investors now see in Spain a market in recovery, with structural plans that help to believe in its future. The four SOCIMIs have created portfolios valued at about 4,000 million euros. The major Spanish investors are not only SOCIMIs but also investment funds, private equity, wealth managers and family offices. The average price for this type of operation is 29 million, compared to major operations, carried out by British investors, exceeding 100 million. 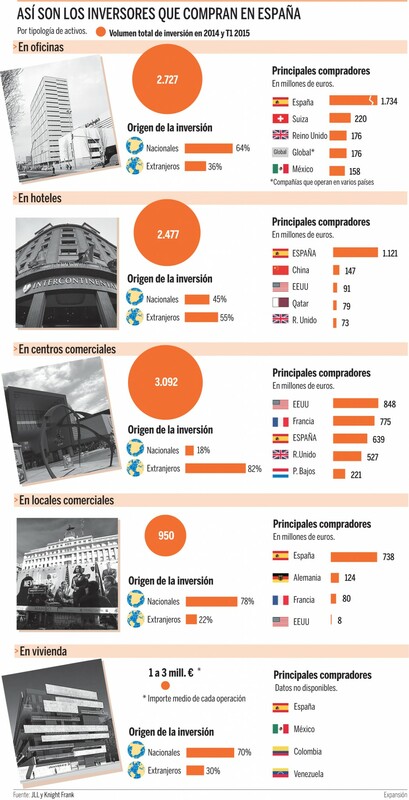 Spanish investors have also surpassed foreign purchases in shops; 78% versus 22%, respectively. The average price in these operations is 37 million and the most common buyers are usually traders (such as fashion brands), family offices and private investors. In shopping centers and hotels, the international buyer dominates. Thus, from the 3.092 million invested in shopping centers between 2014 and March 2015, 82% was corresponded to foreign capital. In Spanish hospitality sector, there are different buyers from Chinese investors as Wanda Group to fund Qatar, as Katara Hospitality. In the residential market, several US funds have chosen to buy land is Spain.